National Teacher Appreciation Week | Diary of a Public School Teacher! What Do Teachers Really Want? 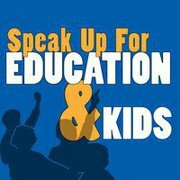 Speak Up For Education and Kids is a group started by the National Education Association to unite educators and community members committed to investing in education, preventing harmful cuts, and ensuring students have the bright futures they deserve! I came across their site on Facebook. They have a section called Ed Votes poll. I checked out their poll and the question was, ” Which gift you would most like to receive on May 3 for Teacher Appreciation Day?” I found it interesting because their choices were not typical choices. For example, one of their choices was a request for more professional development opportunities. Another was smaller class sizes so teachers can give individual attention to students. (My choice). So far, smaller class sizes is in the lead, followed by less standardized testing. A number of teachers responded with choices of their own. One teacher commented that she would like her job back! If you have a second, please add your voice to the votes. I am going to check back later. Maybe they can show the votes to our legislators, so they can see what we really want! Speaking for myself, I don’t need another bag with the district logo on it! Education Votes Poll: What Gift Would You Like to Receive on May 3? NEA, along with its Kansas and Indiana state affiliates and the Dodge City (Kan.) Local, lobbied Congress to create a national day to celebrate teachers. Congress declared March 7, 1980 as National Teacher Day for that year only. Can you imagine what it would be like if teachers were treated like actors, athletes, singers, or even “reality tv “stars?” Wow! “Mrs.Smith, Mrs.Smith, can I get your autograph?” She turned and smiled brightly at the young woman running towards her. Mrs.Smith and her husband entered the Four Seasons and were immediately seated at the best table. The maitre d’ smiled, and thanked Mrs.Smith, again, for teaching his son when she taught at Tower Hill. After dinner, Mr. and Mrs.Smith hopped into their Mercedes and drove home to their ten bedroom house up in the hills. They entered their home, and stopped to pick up one of the cameras left by the crew from MTV Cribs-Teachers. She sat down, stared out at the ocean, and began grading. The phone rang, and her assistant teacher, Marjorie spoke excitedly. She hung up and the phone rung again. As teachers walked down the red carpet, former students and teachers screamed their names. Reporters rushed up to interview each teacher as they strode down the carpet. I know we all don’t need a Mercedes, a ten-bedroom home, to be filmed by MTV, or have an overrated awards show. But wouldn’t it be great if teachers were respected as much as actors, athletes, singers, and yes, even “reality” tv stars?